Can there be a less auspicious start to a film than a trip on the 7 Train? Yet, in this case it is rather apt. Like the desperate screenwriter character making his way into the City, the film longs for Manhattan prestige, but is stuck out in the outer boroughs. One script to die for might just change everything in Hilarion Banks’ Three Holes and a Smoking Gun (trailer here), which opens this Friday in the Los Angeles it so bitterly resents. Bobby Blue Day was once a Hollywood scribe who worked with the Spielberg-esque Stephen Worthy, but now he is teaching a screenwriting night class in New York. He is paying an unexpected early morning visit to John F. Kennedy Ariamehr, his formerly least promising student, who just turned in a perfect screenplay. Ariamehr has just spent the night with Sailor Stewart (seriously dude, what is up with these names?) a fellow student who was recently involved with Day. Fortunately, she is off to an audition, so Day and Ariamehr can get all thrillery about his screenplay. Day might just kill to get his name on that screenplay, but if he does, he won’t be the first. As we learn from a long, credibility challenged flashback, Ariamehr already lured the true screenwriter, one Winston Mimsby (he’s British) to his death. In fact, it was a rather prolonged death by poisoning. Frankly, it is hard to believe the guileless Mimsby would write a script called Hijack, but not only did he do so, he cranked it out on an old school Remington. Therefore, Ariamehr must rush out into the night on a hard target search for his own vintage 1940s typewriter. At least, it provides us with the film’s best scene: a slightly surreal encounter in Joey the Junkman’s antique notions shop. Unfortunately, it is followed by a would-be mugging scene that perversely neither Ariamehr nor his hemophiliac assailant want to walk away from. 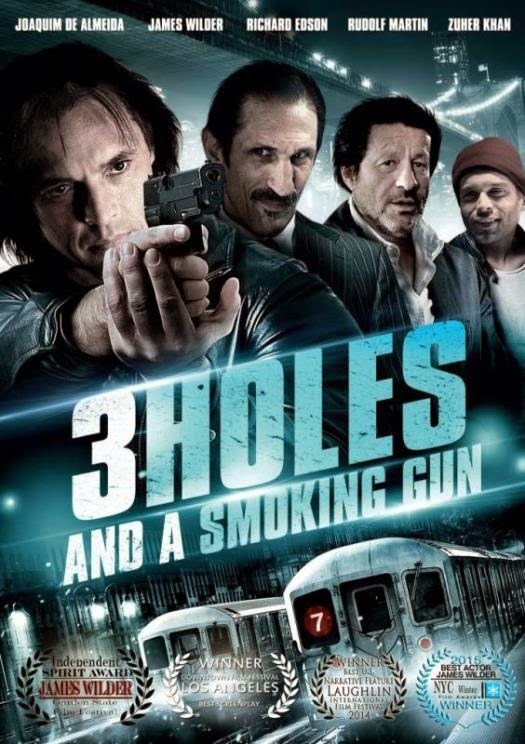 Once known as 3 Holes, 2 Brads, and a Smoking Gun, the film’s title has wisely been shortened. Are the two Brads like the two Jakes? Actually, they are both Brad Bradley, a nemesis from Day’s Hollywood years met in yet another flashback. The three holes are probably metaphorical, but the smoking gun is readily identifiable. Regardless, 3 Holes et al is intended to be a screenwriter’s riff on Ira Levin-Sidney Lumet’s Deathtrap, but it is way too overloaded with red herrings and Pacino quotes. The film’s overwhelming MVP by far is Joaquim de Almeida (Desperado, 24) whose too brief appearance as Joey the Junkman enlivens the film and hints at tantalizing craziness that is sadly never realized. On the other hand, cult actor Richard Edson (Joey Breaker) is largely wasted as a third act copper. Man, let’s hope nobody was killed over this screenplay. James Wilder labors like a rented mule as Day, but he still can’t make it work (he’s also an architect and a juggler, so we applaud his versatility). It was obviously a labor of love, but either the severe budget constraints forced some unduly harsh choices or the creative team lost their perspective along the way. Now available on most VOD platforms, 3 Holes and a Smoking Gun opens this Friday (3/27) at the Laemmle Music Hall 3.